Global carbon market expected to crash, already loses half of its value since 2011, from $18 to less than $10 in 2012 | Watts Up With That? ← One more benefit of warming? WUWT [Global carbon market expected to crash] is already #1 on a Google search. 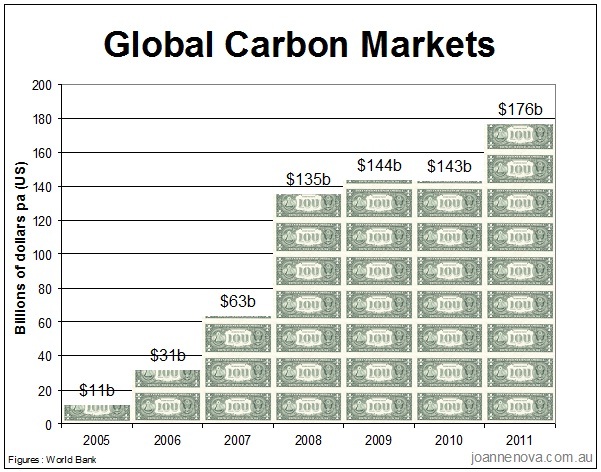 Keep talking about a carbon market crash and it will happen. Excellent! Ha! Maybe we can all make Al Gore-ish millions shorting the market until it collapses in a heap. But beware – I seem to recall the last time the bottom fell out of it the EU Parliament simply changed the rules and nailed the price to the perch. As if there wasn’t enough evidence that this is a ‘political’ rather than a free market. There’s only one way to make money out of carbon and that is by burning it. Does the planet a power of good too. Australia. $22 Aus per tonne. Economic suicide before your very eyes. The beautiful thing is that the tax is being introduced during the most intense cold snap for decades! Don’t worry about carbon trading there is more reality to worry about—-the collapse of the Euro, with Spain today asking for direct help for its banks, Greece about to pull out in about 2 weeks, Portugal still in trouble after being helped, Italy about to tip into the void of failure and all this on the backs of the German people who, understandably, do not want to help. Oh the joys of Europe and the Eurozone big idea. Thank goodness we still have control over our own currency in the UK. We might have problems but we are our own people not totally controlled by some left wing Eurocrats in Brussels. Good. When all the profit goes away, the “science” will go away. It seems to me people do not understand what the real debate is about. 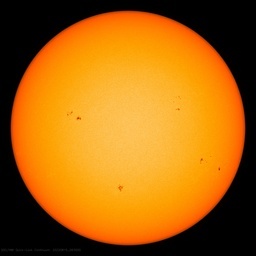 Scientists have shown that earth has not warmed since the beginning of this century. In fact, my own (totally independent) investigations lead me to believe that earth has cooled since that time. There is no “carbon market”, simply because it is a non-issue. In related news, a excellent article in FP about new oil finds and how they relate to the AGW meme and the upcoming Rio+20. I suspect the lack of enthusiasm by major world leader will bury the carbon market forever. Just months after an enormous discovery of natural gas off the coast of Israel, a local company has reported another potentially big strike — an estimated 1.4 billion barrels of oil, in addition to more natural gas. The company, Israel Opportunity Energy Resources, says it will start drilling by the end of the year. All of a sudden, Israel has found itself a focus of the world’s hydrocarbon interest. I create fiction too, but I can never sell mine. I only get rejection slips. I’m jealous. Another dot com bust coming. This time in carbon trading. Hey eco greenies, couldn’t all that money be spent on something real, that would benefit the third world population?? In BC the carbon market is being used to siphon off taxpayer money from the school system, which by law must be carbon neutral. This money is then being used by corporations to fund relocation of their CO2 intensive operations offshore. For example, instead of using taxpayer money to install an energy efficient new furnace, the schools are required to use this money to buy carbon credits. Companies with connections create these credits by for example shutting down a CO2 producing facility in BC. This taxpayer money is then used by the companies involved to set up a new facility in China to replace the facility shut down in BC, with a nice campaign contribution to the party in power as a reward for their help. The result, the schools are left with an old furnace, but are “carbon neutral:. TV companies become rich running government (taxpayer funded) ads telling us how wonderful this all is, that BC is carbon neutral. Taxpayer’s get to sleep well knowing that their tax dollars are being spend so wisely to “Keep BC Green”. The government gets to sleep well, knowing their campaign funds are well stocked for the next election. The businesses involved get to sleep well knowing they have been paid to replace their old plants with newer, more efficient plants. The Chinese are happy, because the money invested in China is now flowing back to BC, where it is being used to buy large volumes of real estate. Plane loads of Chinese arrive in Vancouver each day, are driven by agents to prospective properties, place an offer and are back in the planes. The homeowners are happy, they get a large payout and no longer have to pay the sky-high property taxes that are the source of the school taxes. That is the power of carbon trading. Which is why all the emphasis now for carbon taxes from everyone .. Peak carbon? Should we worry? So much money …… so little value. Basically the various UN agencies, the OECD (which we provide a big part of the funding for), and the World Bank are all using our money to adopt policies to push us towards a post-GDP theoretical Green economy whether we like it or not. Whether we are aware or not. But don’t worry since history shows that planned and managed economies in complex societies have poor economic results we will use education to make sure the future citizens learn to appreciate values more than things. If a regulator or bureaucrat “creates” a market, it’s not a market at all. Actually I’m not sure it’s as ideological as that. If you check out the article I’ve reblogged you can see Goldman Sachs were in on the ground floor with carbon trading, and there’s always been a powerful sector of multinational bankers and traders lobbying for action on “global warming”. That’s the angle that really sells the deeper agenda to me. Carbon Climate Forcing is using Climatology Default Swap Science to FORCE Carbon Commodity Marketting….always was….always will be. Seven billion people on this planet NEED wheat. Several thousand stock/bond manipulators NEED Carbon credits. It is time to starve that market. It would be great to know how many pension funds are salted with these investments. Do you suppose pensioners would like to know? Oh well, on to the next craze. Tulips anyone? It would be great to know how many pension funds are salted with these investments. The BBC pension fund is stuffed full of ‘green investments’. Just saying…. I couldn’t understand why Quebec was jumping on that wagon lately when every one else is getting away from it. Now it makes sense. There must be some powerful people in Quebec that want to get their investment back ASAP. Mulcair (NDP) has an agenda to transfer wealth to Quebec from Saskatchewan and Alberta via Cap’n Trade. Cap’n trade would funnel billions into Quebec due to their Hydro power !! From the executive summary: Yet even as prices declined, the value of the global carbon market climbed in 2011, driven predominantly by a robust increase in transaction volumes. Not to put too fine a point on this fraud, …..
they take $178 million dollars in paper carbon credits and trading it 1000 times a year between a few hundred computerized trading accounts and EQUATE that to the GROWING of $178 Billion dollars of wheat and it’s consumption by billions of people. Hardly the “same value“. I am reminded of a phrase from the Hitchhiker’s Guide to the Galaxy concerning the Marketing Division of the Sirius Cybernetics Corporation…. first against the wall when the revolution comes. but they still include the idiot comments that CO2 is pollution..
quidsapaio-in tracking what is going on in education globally I kept (still do) intersecting various reports from all the agencies I listed explaining their Green Growth agenda and how their support for education policies is essentially designed to change what people value, feel, their attitudes, etc so they will be on board with the agenda voluntarily. It’s not an explanation I went looking for but if someone says we are collaborating, this is who we are working with, and this is the common goal, we should darn well take their word for it. They view education and climate change propaganda as useful tools to get people to do voluntarily things that will enable a centrally planned, managed economy. I think the idea that what was wrong with China and Russia was just applying the techniques to an agricultural economy, instead of an industrial one, to be illiterate. But empowered people with OPM get to be ahistorical illiterates without a loss of power. So it’s up to us to figure out what the economic consequences of what they declare they are doing will likely be. And to document what they have been in the past. And tell the story and hopefully get traction in time to take their decision making power away. At least that’s the best plan I have been able to come up with. Maybe it is time for the rest of Canada to have a Referendum to throw out Quebec from the Confederation. That would be quite a twist from them wanting to separate all the time. You’ve still got sterling because it’s all controlled by the City – and that’s a private corporation not part of the UK. for some history of Bank of England. Which, I’ve just remembered, but fuzzy, something about it being nationalised at some time, was it Harold Wilson? Maybe just wanted to. Anyway, that’s why they’re going a bit nervy now, claiming that some EU policy shouldn’t include the City. One of the lead authors is from NYSE / Bluenext the global carbon exchange. Shame on the World Bank. This report can’t have any credibility. Don’t take my word for it just search on the authors. Yes, but it was caused by global warming because the warming is in the pipeline and just think of the children. Ahh yes – nice point – I’ll have to dig out my old copy of Mackay’s book. When the carbon markets crach everywhere else, California’s will just be starting up. And that will drive the rest of our businesses out of the state. Yikes! I’d better pack up and load ma, pa and my kids on the old model T(oyota) and head for Oklahoma! Or maybe Texas. I might just have enough money for gas to get there, and maybe I can do some programming for food. Since the real underlying “price” of carbon emissions is negative (it should be subsidized, i.e.). The Invisible Hand has the Carbon Markets by the throat, and is going to choke them to death, like it did the CCX. Yes, but it (=the cold snip in AU) was caused by global warming because the warming is in the pipeline and just think of the children. You are joking, right? You are putting us on. No scientist has proven to me from actual measured results (in the right dimensions and with the right testing) that the net effect of more carbon dioxide is that of warming. and go play with your puppets. It is getting colder here too. Bad cold front is coming up. Just looking at the weather station in Kimberley (South Africa) I noticed that average temperatures have dropped there by 1.5 degrees since the beginning of this century (2000). It shows when you fly over Kimberley during daytime. Barry still “believes” that cooling is good. Barry, you are wrong. Cooling is bad. Very bad. That is why I report the things I have measured and say the things that I have said…. My children must know that I did my best. Fair enough REP, but this is serious and I really need some help getting this out there. The World Bank does not maintain an appropriate distance from major carbon market players like NYSE/Bluenext. I can prove it. Just google the main report authors and you will see that one of them is a loaner from NYSE/Bluenext. If you care please provide feedback directly to the bank on http://blogs.worldbank.org/climatechange/carbon-markets-valley-creation. Well, sure–carbon is only valuable as CO2 in the atmosphere to make plants grow. If it continues to “warm” in Oregon we can kiss the 2012 wine crop goodby. All that warming is forming ice crystals as we speak on delicate vineyard parts that came on a bit too early from a warm onset of an early Spring. My gosh Mother Nature has a sense of humor. How come I don’t hear laughter? Think of the children of these grape growers who were talked into planting row upon row of grape vines in Oregon, Idaho, and Washington more than a decade ago. Their livelihoods are being taken away from them by all this global warming. Gosh I am getting good at this global warming language. Well it is looking as if the carbon “investment” is almost as much of a crapshoot as Facebook. Just imagine; a kid still wet behind the ears becomes a trillionaire conning people into publishing for the whole identity theft industry, all the information needed to clean them out, of house and home.